When it’s time to inspect and maintain fire sprinkler systems, you want to make sure they are functional. When it’s time to inspect and maintain fire sprinkler systems, you want to make sure they are functional. If your fire sprinklers aren’t working, then they won’t be about to put out any fires that break out in your building. At the same time, though, you must also to make sure that your systems aren’t too sensitive, which can be just as problematic. It’s a common misconception that smoke is what activates the fire sprinkler systems in your building. The presence of smoke will set off any smoke alarms, but that doesn’t mean all of your sprinklers will turn on in response. Fire sprinklers systems are designed to extinguish real fires. The smoke detectors, on the other hand, will alert you to a fire emergency. However, smoke detectors can’t put out a fire, which is another commonly-held myth. Now, you might be wondering what does activate a fire sprinkler system, if it isn’t smoke. The saying “where there’s smoke, there’s fire” is trite, but true. The built-in heat sensors in the sprinklers will trigger at high-enough temperatures to indicate the presence of fires that are currently spreading. In this case, those temperatures fall in a range between 155 and 165 degrees Fahrenheit. Also, only one sprinkler head will activate at a time. At most, only two fire sprinklers will be needed; however, this depends on the size and ferocity of the fire. 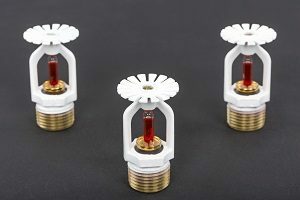 The heat sensors in your fire sprinkler systems can take one of two forms. One type uses a small glass bulb that is filled with a liquid that moves when heat touches it. The other type uses metal links that can fuse together. The liquid in the glass bulbs can be color-coded depending on the temperatures needed to activate them. You’ll often see red glass bulbs that will shatter when the liquid inside starts to expand due to heat. Because of this mechanical design, the only fire sprinklers that will turn on will be the ones closest to the source of the fire. This mechanism helps to contain fire damage and minimizes water damage from too many sprinklers turning on all at the same time. This entry was posted on Tuesday, July 31st, 2018 at 1:23 pm. Both comments and pings are currently closed.